George has received industry VIP invitations to the 2014 Brit Awards. As well as planning for the 2014 MPG Awards and London Fashion Week A/W 14. His 2014 London schedule has completely changed due to film planning and the beginning of principle cinematography on his London based thriller. George will also be attending (The Sundance Film Festival) “Sundance London” this spring. Phil Everly Has Died. The Everly Brothers are part of the foundation of Rock and Roll. They had a profound, seminal, and lasting influence on many of the greatest musical acts in history, and indeed on rock and roll and pop music to this day. 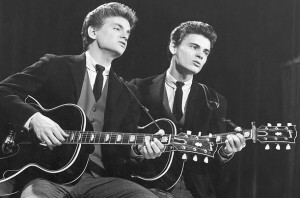 The Beatles, The Beach Boys, Simon and Garfunkel, The Byrds, The Mamas & The Papas, and Bob Dylan were all directly and seminally influenced by the Everly Brothers. A large part of The Beatles pop harmonies and vocal delivery onstage can be directly attributable to the Everly Brothers influence. I was very fortunate to see them live several times. They had a level of song-craft and musical talent that is rarely if ever seen in today’s music industry. Paul McCartney… “When we first heard them we were blown away”!